Abraham Rubin Hercules Benrubi is a beloved character actor who has been working in film and television for more than two decades. He is known by many names: Mose from “Open Range,” Jerry from “E.R.,” and Larry ‘The Kube’ Kubiac from “Parker Lewis Can’t Lose.” He is also the voice of Fidel Castro, Optimus Prime, Darth Vader and a host of other characters on the Cartoon Network’s irreverent “Robot Chicken.” His most recent film, in which he plays Santa Claus, is “A Country Christmas.” A native of Indianapolis, Benrubi is a self-defined music, comic book and Dungeons and Dragons junkie, a voracious reader and an unapologetic beach bum. 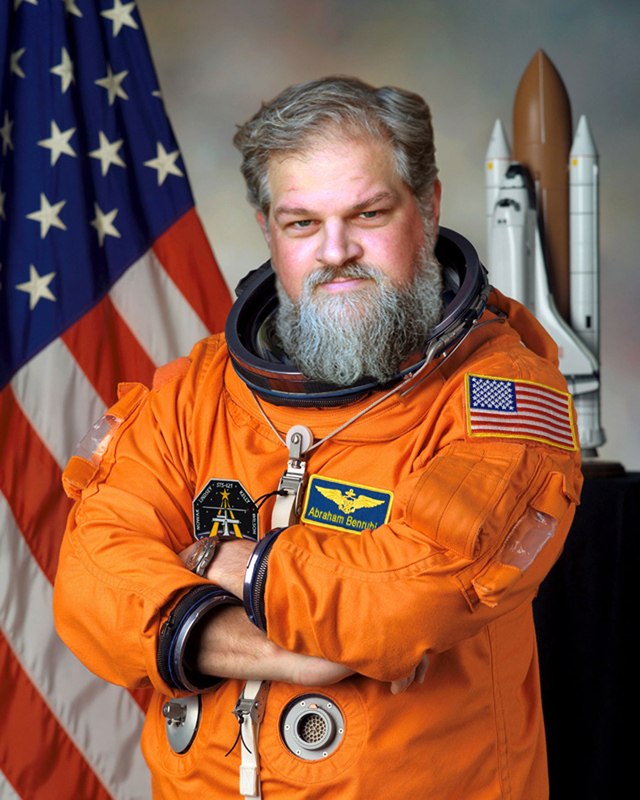 He is enthralled by all things space, having attended space shuttle launches and NASA tweetups, and even was present at NASA’s Jet Propulsion Laboratory for the landing of the Mars Curiosity rover. When he’s not in front of the camera, he advocates for NASA every chance he gets. Q: Why are you excited about space exploration? Abe: It’s the final frontier. Is there other life (as we know it) in the universe? Space exploration is a human endeavor that could unite all the people of the world. Abe: The villains always look way cooler and have a better time, even when they lose. Darth Vader is one of the coolest characters ever. Doctor Doom should have handed the Fantastic Four their behinds numerous times. I remember a cover where Magneto has Wolverine almost impaling himself with his own claws. So cool. When Arcade traps the X-Men. The Joker in Frank Miller’s Dark Knight Returns. Thanos. Galactus. Goldfinger. Jaws, both the shark AND the Bond villain! Abe: I guess the rings of Saturn, but I would take the scenic route. Q: Marvel or DC comics? Abe: I always preferred Marvel comics to DC. I think I identified more with the struggling heroes like Spider-Man and the X-Men, social outcasts, nerds even. The DC heroes felt more untouchable. I mean Superman has only one weakness and it’s a rare (though not rare enough) stone from his birth planet. Daredevil is freakin’ blind. The only DC book I ever really got into was the Marv Wolfman/George Pérez run on Teen Titans. I don’t even read super-hero comics anymore. It all got pretty formulaic. I go for crime & supernatural comics like Ed Brubaker’s Criminal & Fatale. Those I still buy. Abe: Water. Sunscreen. A beach towel. Flip-flops. And a record player (with records). Abe: That’s a lot of people to choose from. I admire anyone who has the discipline to pass the rigorous physical and mental challenges required by space travel. I am grateful to most of the scientists, engineers and inventors throughout history, who’s accomplishments have brought us into this marvelous modern age. Q: Orion slave girl or the Borg’s 7 of 9? Abe: I don’t even know who 7 of 9 is, so obviously it’s the Orion slave girl. Want to know something amazing? Both the Orion slave girl AND Batgirl in the 1960’s Batman TV show (which I loved) are played by the same actress!! The uber-hottie Yvonne Craig! Somebody got their chocolate in my peanut butter! Abe: Mars holds a lot of allure, and seems like the most likely candidate for human occupation in my lifetime. I am fascinated by Venus, rolling clouds of carbon dioxide. The most beautiful planet is Saturn. The unique rings. The many moons. But ultimately Earth has to be the favorite. It’s home. Abe: Sometimes you have to destroy then rebuild. I am a lifelong fan of Lego’s so building is in my nature. I do like to destroy some stuff though! Abe: NASA, of course. I am particularly fond of the work being done at the Jet Propulsion Laboratory. I don’t think the general public really understands just how much our space agencies do for the world. Abe: STS-134. The second to last Space Shuttle launch. I had the privilege of attending the launch with a NASA tweetup group and even though it was scrubbed, we were graced with an extraordinary tour of the Kennedy Space Center. So much history. So many amazing artifacts from the entire history of space flight. I highly recommend taking a tour of KSC’s visitor’s center. Abe: 2001: A Space Odyssey. This film is one of my earliest memories of space travel, and still seems the most realistic. I remember as a young man sitting on the massive grass terraces behind the Indianapolis Museum of Art and watching Kubrick’s masterpiece on a massive outdoor screen. Looking up at the glittering night sky, it was easy to imagine that one day, man would travel by space ship. Abe: This isn’t REALLY a fair question. I grew up on Star Trek, but Star Wars changed my life. I remember standing in line to see what my father had billed as “some UFO movie.” I’d never seen a line for a movie before. We got in late and wound up sitting in like the fourth row. When that Star Destroyer came rumbling across the screen, the theater shook. Star Trek always felt a little clean and cheesy after that. I watched the Next Generation but didn’t really pay attention to Trek afterwards. I still watch Star Wars and Empire. Still listen to those soundtracks. Abe: I guess I prefer aliens. Robots always seem to either betray their makers or break down. Aliens are mysterious and unpredictable. Exotic. I always loved Wayne Barlowe’s Guide To Extraterrestrials. Those illustrations were amazing. That’s how I found out about H.P. Lovecraft, Jack Vance, Stanislaw Lem and so many authors I came to adore. Q: If you could play any part in any sci-fi/space film or TV show, past, present, or future, what would it be? Abe: Darth Vader. I actually do play Darth Vader in the Robot Chicken Star Wars Specials, AND a semi-super-secret Star Wars show called Detours that may eventually see the light of day. I would also love to play Godzilla. Abe: In real life? I like Cassini. In fiction? Imperial Star Destroyer!